Datalex, one of the world’s leading travel reservations system providers, used Hexawise to turn sets of existing regression test suites for manual testers into improved automated regression test suites. 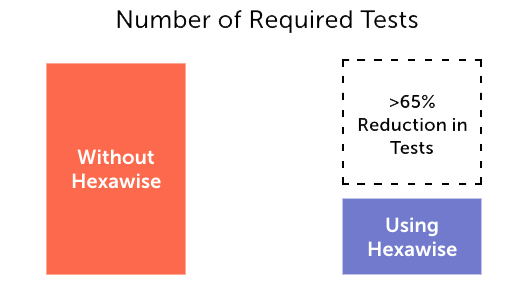 Using Hexawise greatly reduced the time required to create automated test suites. 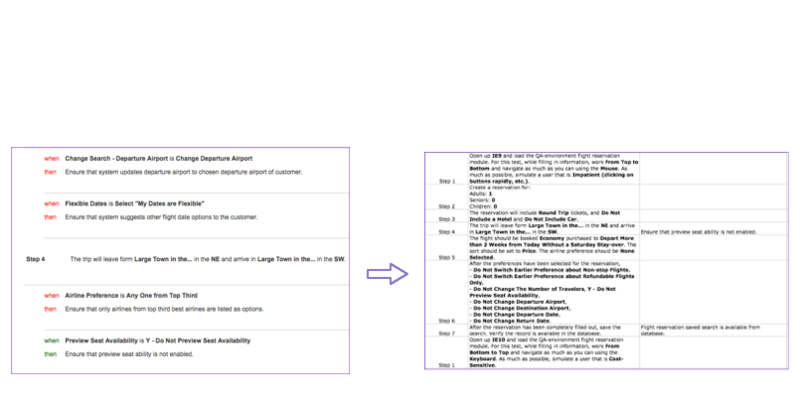 In addition, the resulting Hexawise-generated test sets were systematically designed to be more thorough, formatted to be used easily in automated test scripts, and specially-structured to be much easier to maintain over time. Datalex is a leading commerce platform provider to many of the the world’s largest airlines. Regression testing suites at Datalex involve ensuring that billions of transactions per year will be processed correctly and in a timely fashion. Evidence: It took approximately 2 seconds per regression test suite for Hexawise to identify 100% of the necessary test conditions in each optimized set of Hexawise-generated tests once testers entered test inputs inputs and constraints into Hexawise. The generated tests scenarios were all consistently and clearly formatted (and significantly easier to translate into automated test scripts as compared to the original set of manually selected tests which were occasionally ambiguous or incomplete). Evidence: Using Hexawise allowed Datalex to reduce their test suite by 65%, saving them considerable time and effort without decreasing their overall test coverage. How was this possible? 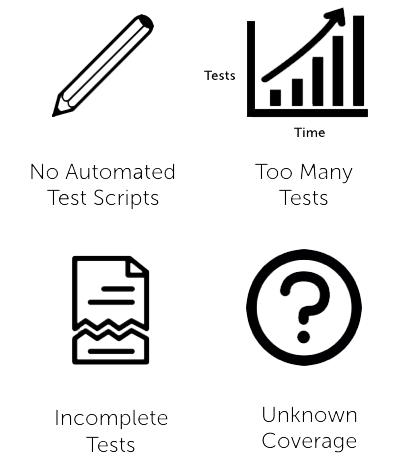 All generated tests were complete, clear, and consistently formatted, making it much easier to turn them into automated test scripts. Evidence: Testers “Auto-Script” tests in Hexawise. At the push of a button, Hexawise automatically “fills-in-the-blanks” with the appropriate test conditions... for every step in every test. Once the test designer entered rules into Hexawise, Expected Results are generated instantly for every applicable test. Hexawise creates complete, clear, consistently formatted, and reusable test assets that can easily be automated. Evidence: Prior to implementing Hexawise, Datalex did not possess a clear understanding of exactly what was covered after each test they executed. Hexawise now provides Datalex with a quantitative representation of exactly what is covered after each test through the Coverage Matrix feature. 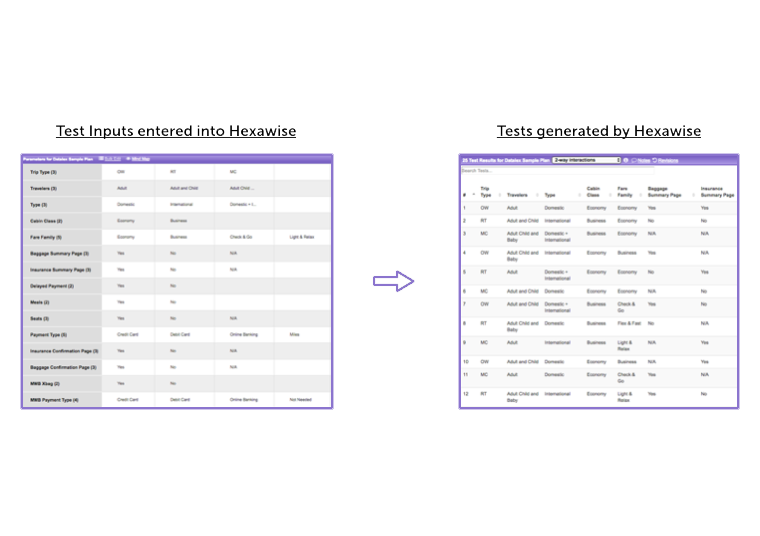 Coverage analysis consistently shows that Hexawise-generated test sets achieve more thorough coverage than hand-selected tests.